Blog Can you use tap water for hydroponics? When I first became interested in hydroponic gardening I used tap water without giving it a second thought. It was only some time later when I was disappointed about the quality and health of the plants that I was growing that I looked a little deeper and discovered that untreated tap water is not the best option for hydroponic gardening. A basic mistake, but we all have to start somewhere. Home tap water contains a range of chemicals and minerals which can be damaging towards plants. Thankfully, there are ways to test and treat your tap water to make it safe for your plants. Read on and I’ll tell you all you need to know about whether tap water is suitable for hydroponic growing. In an ideal world it would be best to start with entirely pure water when mixing a hydroponic nutrient solution. This enables you to precisely determine the exact proportion of nutrients that your plants will receive. What’s Actually In The Tap Water In Your Home? I recently checked the quality of the tap water coming into my home and discovered that it is routinely tested for 82 different chemicals, minerals and bacteria. Surprisingly, my local water had failed a recent test for lead content, which was a bit concerning! Some of these chemicals cause no major issues with hydroponics, but many can significantly impact the health of your plants. Your local water supply may come from a variety of sources and the mineral constituents of it will depend on the geology of your surrounding area. There will also be numerous other chemicals such as copper, lead and organic material that enter the water along its journey from raindrop to the tap in your house. Your local water treatment plant will take water directly from local water courses and treat them in a variety of ways before entering the domestic water supply. It is the job of your local water treatment works to ensure that excess levels of harmful materials are removed from the water supply to make it safe for domestic use. The first step in the water purification process is to adjust the pH of the water by mixing it with aluminium sulphate. This is a compound which helps the impurities within the water to clump together making them easier to remove. Rapid mixing of the water maximises the amount of aggregation of the impurities within the water. The next step in the water purification process is for the water to be slowed down and allowed to rest in flocculation basins. This allows the aggregated impurities to come together further which will make them easier to remove. The water is then moved into sedimentation basins and the aggregated floc is allowed to sink to the bottom of the sedimentation tank, where it is removed from the water supply. Once the larger impurities are removed from the water supply, the water is moved into filtration tanks. These tanks contain filters made from fine sand and gravel, which allow any smaller particles and microorganisms to be removed. The water is then disinfected using small amounts of chlorine and ammonia which prevents bacterial growth in the water supply. Things About Tap Water That Can Affect Hydroponics? There are three main things to consider about tap water that can affect hydroponics. Chlorine is a toxic gas, but it has many practical uses in industry and public health. Most people know that swimming pool water is chlorinated to act as a disinfectant to prevent the spread of disease. The same thing happens to tap water, but the concentration of chlorine that is used is significantly less. Chlorinating water is a fantastic public health measure which ensures that our tap water is safe to drink. However, even at low concentrations, chlorine can be quite toxic to growing plants. When growing plants in soil, much of the chlorine is removed by the process of the water moving through the soil. When using hydroponics, there is no soil to provide this function. Thankfully, removing chlorine from tap water is an easy process as it is quite a volatile gas and will evaporate from the water in the presence of sunlight. One of the most common ways of removing chlorine from tap water prior to using it in a hydroponic system is simply to leave it out in the sun for between 12 and 24 hours. This should reduce the chlorine levels in the tap water to a level that will cause no problems for your hydroponic plants. Chloramine is a compound of ammonia and chlorine. It is made by replacing several of the hydrogen atoms in ammonia with chlorine atoms. This Is also used as a disinfectant agent for domestic tap water. It is becoming more popular as it is more effective and longer lasting than chlorine. There are a number of significant negatives of chloramine. It can cause tap water to have an unpleasant aftertaste. It can also lead to increases in fluorocarbon and iron concentration in tap water, which can be hazardous to human health. 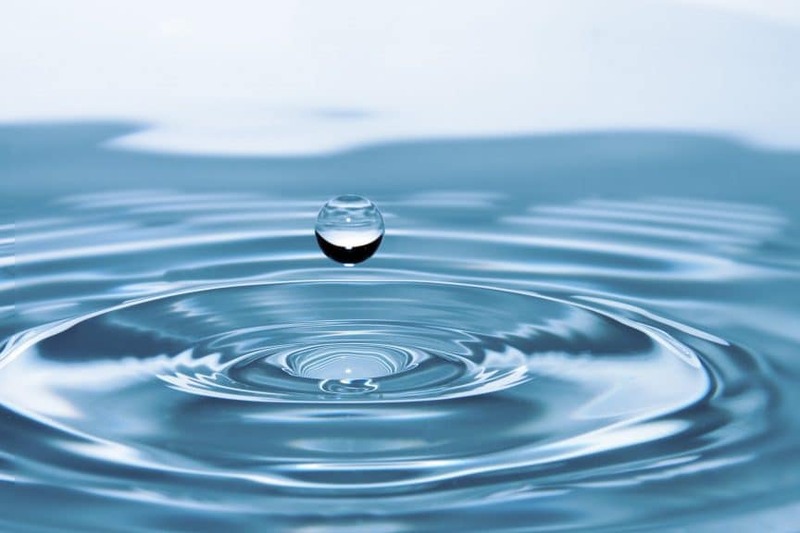 Chloramine can be removed from tap water by the same process as removing chlorine, but you will need to expose the tap water to sunlight for considerably longer due to the greater stability of chloramine. Another solution to remove chloramine from tap water is to use an activated carbon water filter. These are already quite common and many people choose to run their tap water through an activated carbon water filter prior to drinking it. As previously mentioned, the quantity of dissolved minerals in your tap water depends on the underlying rock formations that the water runs through before it reaches the water treatment works. Rainwater is normally slightly acidic due to the reaction of water with carbon dioxide in the atmosphere. However, it does not contain very many dissolved minerals. Once the water falls to the ground it will seep into the soil and travel through soil and bedrock until it enters the waterways. During this process, mineral compounds, most commonly calcium and magnesium, from the rocks will dissolve and react with the water. The hardness of water is measured in PPM (parts per million). This is the amount of dissolved minerals as a proportion of the water. (e.g. 100 parts dissolved minerals for every million parts water). Soft water will have a PPM level of under about 60 PPM. Water at this level or below should cause minimal problems with hydroponic growing. A PPM level of between 60 to 180 would be considered moderately hard, and over 180 PPM is very hard water. Very hard water will have high quantities of dissolved minerals. The most important ones for hydroponics are the levels of magnesium and calcium. Why Is Hard Water Bad For Hydroponic Plants? There are a number of problems with using hard water for hydroponics. Firstly, you will typically be using a defined concentration for your hydroponic solution. If your hard water is already at 400 PPM and the target PPM of your nutrient solution is 800 PPM, then half the concentration of your solution will be unknown minerals, which may or may not be beneficial for your plants. Secondly, the large quantities of magnesium and calcium that are dissolved in tap water are typically too big to be of use to growing plants. These still add to the concentration of the solution and can lead to nutrient lockout. They also tend to cause aggregation with other dissolved nutrients which can affect both the pH and nutrient content of your hydroponics solution. Thirdly, high quantities of calcium carbonate in your tap water will raise the pH of your water. For hydroponic growing, the pH should generally be between 5.5 and 7, depending on what you are trying to grow. A pH of over 7.5 will cause increasing problems. Hydroponic nutrient solutions typically contain chelates to assist in making micronutrients available to the plants. There are a number of hydroponic nutrients, which are very reactive with other dissolved solids within the water. Iron, for example, is highly likely to react with the other dissolved solids such as carbonate and phosphate, which will lead to the formation of an insoluble salt, which will precipitate out of the solution. This causes them to be unavailable to be taken up by the plant roots. The role of chelates is to surround the reactive molecules such as iron, preventing them from reacting with other dissolved compounds, so that they remain available to be taken up by the roots of the plant. How Can I Find Out If I have Hard Water? The simplest way is to contact your water company and they will be able to tell you or provide you with a recent water quality report. The second way is to purchase a TDS/pH/EC meter. This is an great device which will tell you the characteristics of the water you are using and is an important thing to own for anyone growing plants with hydroponics. What Other Forms Of Water Can Be Used For Hydroponics? If your tap water has a high PPM, you may want to consider alternate sources of water for your hydroponics setup. Distillation uses a process of evaporation and condensation to separate the constituents of a solution into their respective parts. In terms of water for hydroponics, it is mainly used to remove the dissolved solids within the water. It will result in extremely pure water with a negligible PPM level. You can distill water at home quite easily, although it may be more cost effective to but distilled water directly. Reverse osmosis is a process which removes particles and dissolved solids from water by passing it through a semi-permeable membrane. Essentially, small water molecules are able to pass through the semi-permeable membrane, but larger impurities and molecules of dissolved solids will be too large to pass through the membrane. This will result in water which is dramatically purer than tap water. Reverse osmosis systems can be purchased for home use and are not excessively expensive. The simplest option is to use water which has been passed through an activated carbon filter. This will remove a lot of the dissolved solids and many, but not all of the undesirable chemicals present in the water. Leave the water out in sunlight for 24 hours. This will remove the vast majority of chlorine. Run the water through an activated carbon water filter to remove the vast majority of chloramine. There are three options to make hard water more suitable for hydroponics. The first option is to purchase distilled water and dilute your own tap water to reduce the PPM to a level that is suitable for hydroponics. The second option is to run the water through a reverse osmosis water filter. A unit can be purchased for home use that is not overly expensive and will produce water which is far more suitable for growing hydroponic plants. The third option is to simply use a carbon based water filtration system. This will not be as effective as a reverse osmosis system and there are some limitations to the type of impurities which can be removed, but may well be sufficient for most hydroponics systems. Coming back to the original question at the start of this article. Yes, you can indeed. You will need to test it and treat it, but in almost all situations, you should be able to use your tap water for a hydroponics system. Let me know your own experiences of using tap water with hydroponics in the comments section below. How Do Self Watering Pots Work?